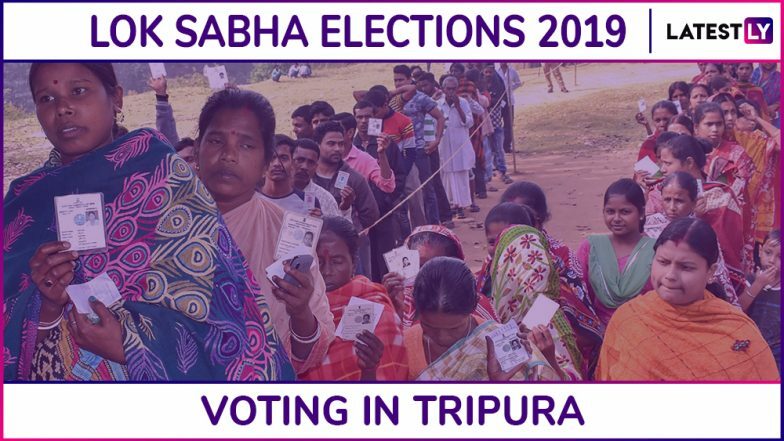 Agartala, April 11: Over 78 per cent of the total of 13,47,381 electorates voted on Thursday for the first phase of balloting in West Tripura parliamentary seat in Tripura, officials said. A poll official said after receiving the final reports from all the district magistrates (district electoral officers), the polling percentage might be increase. In Tripura, the final polling percentage of the 2014 Lok Sabha polls was 85 per cent. No major incident except a clash between the Congress and Bharatiya Janata Party (BJP) workers in Charilam, in Sepahijala district, was reported, said a police official. Ten people were injured in the incident, said police spokesperson Subrata Chakraborty. "At some places, people tried to prevent voters from voting but were thwarted by the security personnel," Chakraborty told IANS. Andaman and Nicobar Lok Sabha Elections 2019: Phase I Voting Ends for Andaman and Nicobar Parliamentary Constituency, 70.67% Voter Turnout Recorded. Voting was temporarily halted at some polling stations due to malfunctioning of the Electronic Voting Machines (EVMs) and the Voter-Verifiable Paper Audit Trail (VVPAT) machines, said Election Commission officials. The voting for one of the two parliamentary constituencies of Tripura began amid heavy security at 7 a.m. and officially ended at 5 p.m.
"However, many voters were still (beyond 5 p.m.) in the queue in front of some polling stations in different districts," the poll official said. A total of 13,47,381 electorate are eligible to exercise their franchise to decide the electoral fate of 13 candidates. A total of 1,679 polling stations, including 30 managed by only women polling officials and security personnel, have been set up.